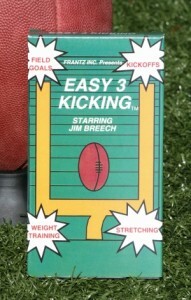 The goal of the Easy 3 Kicking video is to make you the most consistent and confident kicker you can be. While most of the hard work and determination is up to you, Easy 3 Kicking will show you what you need to do not only on the field, but off the field as well. The goal of the Easy 3 Kicking video is to make you the most consistent and confident kicker you can be. While most of the hard work and determination is up to you, Easy 3 Kicking will show you what you need to do not only on the field, but off the field as well. Your on the field instructor will be fourteen year veteran Jim Breech. Jim will show you the fundamentals of successful field goal kicking. Not only will he take you step by step through the kicking process, but will also provide useful training techniques to improve the height and accuracy of your kicks.